From The Grand most important landmarks are within walking distance, including the Van Gogh Museum, P.C Hooftstraat, the Anne Frank House and Amsterdam Central Station. Trams stop at Dam Square and offer easy access to the entire city. Please note, a road barrier with an automatic rising bollard is activated near the property. This bollard will only be up between 22h00 and 06h00 on Thursdays, Fridays and Saturdays. Guests arriving at this time can contact the property to free the way to the hotel. 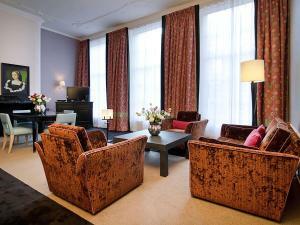 Please note that it is not possible to accommodate an extra guest in the Superior Rooms or Classic Rooms. No extra beds/children's cots can be placed in these room types. Please note that guests are required to show the credit card which has been used to make the booking, upon arrival. If this is not possible, guests should have an authorization form, signed by the credit card holder if he/she is not travelling along. Spacious room with seating area and garden or canal view. Has a marble bathroom. Most of these rooms have a rain shower. Please note that it is not possible to accommodate an extra guest in this room. No extra beds/children's cots can be placed in this room. Has a marble bathroom. Most of these rooms have a rain shower. Please note that it is not possible to accommodate an extra guest in this room. No extra beds/children's cots can be placed in this room. Wheelchair friendly rooms are available upon request. Modern room with stylish bathroom including free toiletries, bathrobe and slippers. Please note that it is not possible to accommodate an extra guest in this room. No extra beds/children's cots can be placed in this room. This luxurious suite features an elegant design. It is equipped with a minibar and TV and the bathroom is fitted with a shower, slippers, a bathrobe and free toiletries are provided. This junior suite features a bathroom with walk-in rain shower and bath. This suite features a subtle mix of classic and contemporary furnishings. This suite features cable TV, a minibar and a coffee machine. This double room features a bathrobe, cable TV and minibar. This suite has a cable TV, air conditioning and minibar. This suite has air conditioning, view and minibar. This double room features a minibar, cable TV and air conditioning. Please note that it is not possible to place extra beds/children cots in this room. This suite has a bathrobe, minibar and air conditioning.